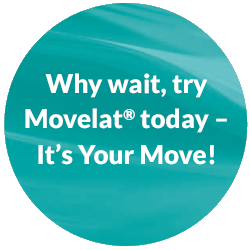 Movelat is different from other topical analgesics because they combine the effects of two active ingredients - an effective anti-inflammatory and an absorption enhancer which means that Movelat can actually get to work beneath the surface. The MPS (Mucopolysaccharide Polysulfate) and salicylic acid work together, with the salicylic acid gently softening the skin to allow the MPS to be absorbed where the inflamed and painful tissues are. Movelat is specially formulated in a choice of cream and gel which can be easily massaged onto the skin to help bring relief from pain caused by inflammation beneath. Movelat can also be used to treat pain due to rheumatic and non-serious arthritic conditions.